The director of the Department of Internal Medicine IV at the University Hospital of Halle (Saale) is PD Dr. med. Lutz P. Müller. He is also the head of the Center for Cell and Gene Therapy of a federal state Saxony-Anhalt. This Center specializes in hematology and internal oncology. The Department of Internal Medicine IV (Hematology and Oncology) covers the whole range of hematology and oncology. This includes prevention, diagnosis, therapy and post-operative care for cancer of all organs and blood. According to the Focus magazine rating of 2017, the Department of Internal Medicine IV at the University Hospital of Halle (Saale) ranks among the top German departments specializing in colon cancer treatment! The Department under the direction of Dr. med. 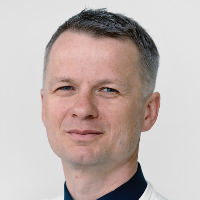 Lutz P. Müller pays special attention to the treatment and study of leukemia and lymphomas, tumors of the gastrointestinal tract, neuroendocrine neoplasms, brain tumors, sarcomas of cell tumors and supportive therapy. As regards bone marrow and stem cell transplantation, the Department of Internal Medicine IV at the University Hospital of Halle (Saale) is the largest center in Saxony-Anhalt. The patients are provided with the most cutting-edge diagnosis and therapy at the highest level. This Department maintains a close cooperation with the rest of the Departments of the University Hospital of Halle (Saale). Moreover, participation in clinical trials opens up innovative treatment options for the patients. 09/2008 Acquisition of the Medical Specialist title in "Internal Medicine"
04/2010 Acquisition of the medical specialist title "Internal Medicine and Hematology and Oncology"
01/2012 Habilitation, Venia Legendi; "Characteristics of multipotent stromal cells and their relevance to the biology and treatment of malignant diseases"
Department of Hematology and Oncology.